I first got wind of BPI Save Up sometime in September last year and opened an account online a few days after that. Since then, I’ve followed up several times through the BPI phonebanker for my information card, had my delivery address changed because I moved jobs, consented to have the information card delivered to the BPI branch nearest me for pick-up, went to that branch to pick it up only to find that it wasn’t there yet and FINALLY had it delivered to my house 8 months after I first opened my account. That’s right. Eight. Months. The weakest link in this whole affair seemed to be the delivery service, a third party provider. BPI’s records showed that the card was promptly dispatched a few days after I set up my BPI Save Up account and for some reason or another, the card just languished with the delivery service. Every time I followed up, the update was that it had been dispatched and was set to be delivered. And since that was the update, nobody seemed to notice that it had been sent out more than half a year ago. Also, another weak link was the branch where I first inquired about BPI Save Up (the Sta. Monica, Malate branch) since the branch reps there seemed to be clueless about their product. When I went to the BPI Sucat Road branch on the other hand, the branch manager was able to answer all of my questions and told me that I could have applied through a branch to get my card right away. And most importantly, she told me that in the event of my death, my beneficiaries didn’t need to present the information card to claim the insurance proceeds and would only need to present a death certificate. It is only open to pre-existing BPI, BPI Family Savings Bank, BPI Direct savings or checking account that has an ATM card. The BPI savings/checking account will be the source account. 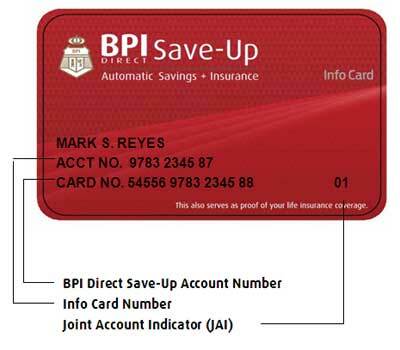 The BPI Save Up account is governed by a group term life insurance agreement. It only covers depositors between 15-60 years old. Deaths due to pre-existing and critical illnesses, regardless of whether or not the depositor knows of such illness or condition at the time of application, are not covered on the first year. Deaths occurring in restricted areas are not covered. Deaths due to suicide are not covered on the first year, except as provided for by law. For your convenience, the following hierarchy of beneficiaries has already been set: 1) Surviving spouse; 2) Surviving legitimate, legitimated, illegitimate and adopted children; 3) Surviving parents; 4) Surviving brothers and sisters whether full or half blood. As per the BPI Sucat Road branch manager, if you don’t want to follow the default hierarchy, you will need to fill out another form and your application will have to be reviewed by their underwriters. When you apply for a Save Up account, you’ll be asked to indicate how much and how often you’ll be transferring money from your source account to your Save Up account. This is to make savings automatic and effortless. But you’re not really bound by this since I have long discontinued the automatic transfer and just transfer money whenever I want to. I’m treating my Save Up account as our emergency funds and also as a way to avail of additional life insurance too. My ultimate goal is to set aside Php400,000 in my Save Up account to act as our financial buffer, and the fact that I’m getting 2M-4M in life insurance simply by parking my money there makes it a sweet deal in my book. Wow 8 months, that was quite a long wait Ms. Jill. I signed up after reading it in your blog. I'm based abroad so I opened the account online and received the card a month after in our Manila address. I'm thankful I came across that blog entry of yours because the automatic transfer feature is 'highly effective' for me in terms of saving money. Minsan nakakalimutan ko may automatic ipon pala ako. I recently emailed BPI on how to increase the monthly amount I've set up early on but haven't received a reply. Yeah, it was a ridiculously long wait for my info card, and I would have gone on waiting forever if I didn't follow it up. I already have this! The good thing about not applying online (I apply on one of the branches near our place) is that you can get your info card right away. I have it on automatic transfer every 15th & 30th. Now I am not sure if how to view my save up from my online account? Sabi nung manager ako na daw maglink eh. You should be able to add another account to your online account. Just tinker with the site to figure out how to do it. The MTD-ADB (month to date average daily balance) is for the Save Up Account. The insurance proceeds will depend on your MTD-ADB for the last three months. Hi Jill. Thanks for the post, and sorry I’m late to the party, but would you know if they will allow me to change my beneficiary? How do I do that? Yes, you can change your beneficiary. Just go to a BPI branch to file the necessary paperwork. You may be able to do that through the BPI phonebankers, but I’m not really sure. But I suggest calling them first to know what the procedure is. Hi how can i withdraw my balance in my save up account? Transfer money from your Save-up account to your regular/primary account and withdraw it from that account. anu po ba ibig sbihin ng “Basic Life” sa insurance coverage? sa paano pong situation ito na-aapply? pag may skit po ba or something? Dun po ba sa dismemberment… may mga category po ba sila i-eexplain sa inyo? Yes, you can deactivate the automatic transfer to your Save Up account. For instructions on how to do that, you can contact a BPI phonebanker.